I arrive early on a windy Sunday morning at the little building below the Cliff House. No, not the Musee Mechanique and not the small, camera-shaped hut that holds the Camera Obscura. 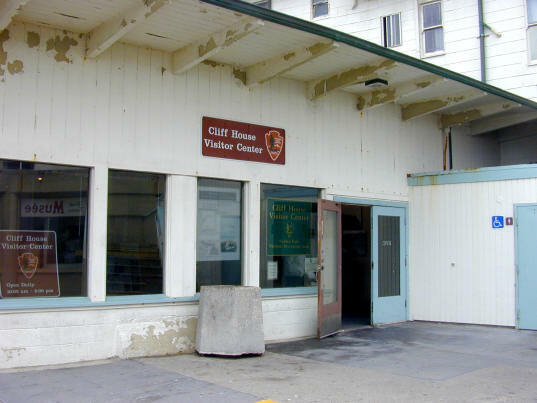 I’m here to open up the Cliff House Visitor Center. 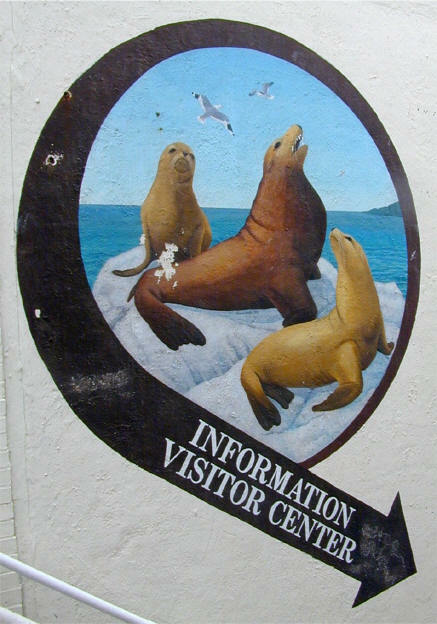 The visitor center used to be the home of the Sky-Tram, a little tram that took people back and forth between the Cliff House’s lower balcony and the other side of the Sutro Baths cove. Most of the folks I have met who remember it say the Sky-Tram was just slow and rusted enough to be ... kind of boring. The building itself is not considered historically important and will not be spared in the upcoming and long-overdue Cliff House Restoration Project. It will be demolished in mid-September. 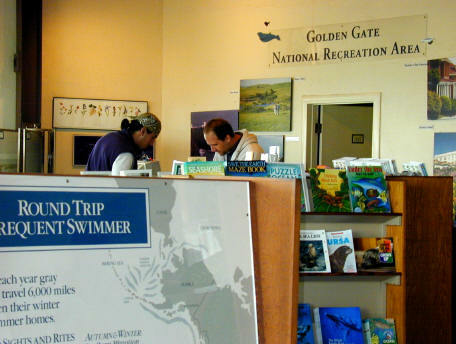 Since 1978, it has been home to the assorted staff members of the National Park Service, the Golden Gate National Park Association, and a group of loyal, long-time volunteers who take care of the place. I was one of the latter, but when departing personnel created a staffing gap, I took the job of filling in three days a week during the visitor center’s last two months of life. 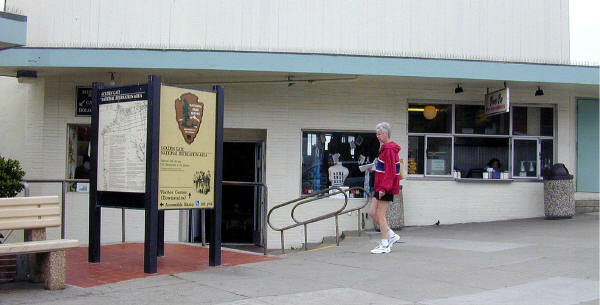 The visitor center will close its doors for the last time on September 3. The Musee Mechanique, old Seal Rock Gift Shop, and the Pronto Pup will follow. It is sadly ironic that the closure of the Musee will correspond to the 30th anniversary of the closure of Playland-by-the-Beach. It is bitterly ironic that only now do they appear to be finishing construction on the condos that replaced Playland. At 10:00 a.m., I open up for the first of the hundreds of visitors who will come through our doors. They will come from all over the world. They will be deposited here by tour buses that routinely take people out to the Cliff House. “Why did the bus bring us here?” one will ask me. I try to explain why a tour bus would bring them here. If that doesn’t work, I change the subject to, “Where are you from? For some visitors to Land’s End, Ocean Beach will be their first experience with the Pacific Ocean. Others will be returning to the area after many years and they will remember how much fun the Land’s End area once was and how NOT FUN it is now in comparison. Some will take the oral history questionnaire that the Park Service offers, fill it out, and send it back. Others will want to tell me about what they remember but then leave it at that. Some will remember with great clarity and others won’t remember much at all. Some will have entertaining stories. A few will come back looking for very, very specific things that they once saw at the Sutro Baths or at Playland and then be startled when told just how long ago those things were taken away. On weekends there are the visits from Laughin’ Sal’s lone groupie. He stands outside the Musee’s front window, watching her with an open-mouthed stare, and worries about what will happen when the Musee has to move in September. A little bit after 11:00 a.m., people will come into the visitor center to complain that the Giant Camera isn’t open yet. I have to explain to them that it is run by an independent operator and I have no control over what they do. I tell them that I don’t know of any reason why they wouldn’t open up today. They watch me say all of that and wait for me to get to the part where I walk over and open the Giant Camera. When that doesn’t happen, they head back outside to wait. People will continue to come in to ask until the doors finally open over there. It’s annoying, but then it’s hard to stay angry at a Giant Camera. I spend the bulk of my day answering the most often asked question. One that comes from there not being a single seal anywhere near the Seal Rocks. Then again, sometimes it is just easier to make change. 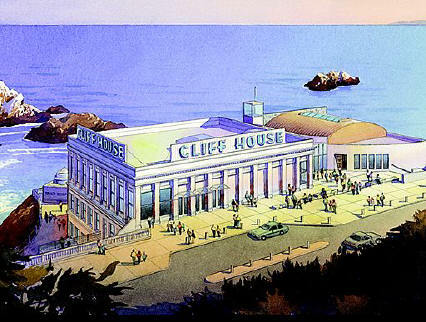 Above us, the Cliff House is humming along, as it has been almost continuously since 1863, when the Point Lobos Toll Road was built to bring people out to dine at the westernmost edge of San Francisco. The renovation project will partially restore the restaurant’s exterior to its original neoclassical design. Today’s Cliff House was built in 1909 to replace the Victorian Cliff House, a massive chateau that was lost to a fire in 1907. The Victorian Cliff House had replaced the much-beloved first Cliff House, an unpretentious-looking roadhouse that had a colorful lifetime from 1863 to 1894. Soon only the restaurant and the Giant Camera will be left at the cliff. In two to three years there may be a new visitor center and museum for the Musee Mechanique. However, they would be located farther up the street in the Merrie Way parking lot area. At the end of the day, the place is filled with people. I don’t shuttle them out the door as quickly as I used to. In 1864, Mark Twain braved cold and fog for an early morning visit to the first Cliff House. He was not impressed: “The impressive solemnity of such a pleasure trip is only equalled by an excursion to Lone Mountain in a hearse.” Twain’s account of the six-mile journey and other Cliff House lore can be found on the Notfrisco.com website. 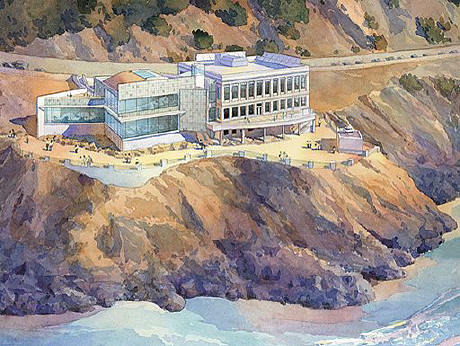 Some of Architect C. D. Robinson's renderings of the new Cliff House are shown here; others can be found on his website, www.cdrobinson.com.